Following yesterday's report that Israel fighter jets unleashed a new attack on Syrian territory, with the resulting explosions so strong they registered as an earthquake, the Syrian army said on Monday that "enemy" rockets struck Assad regime military bases. An official from a regional alliance including Iran, Hezbollah and Syria, said Monday that the strikes killed 16 people, among them 11 Iranians, according to the New York Times. The report said the bombardment also destroyed 200 missiles. According to a report on a Syrian newspaper facebook page, the attack was attributed to the U.S. and Britain although numerous reports also accuse Israel of being the responsible party. So far nobody has claimed responsibility for the massive airstirkes. Media outlets affiliated with the Syrian opposition claim 38 government soldiers were killed in the strike in Hama, with an additional 57 wounded. The Syrian newspaper Tishreen reported on its facebook page that the attack was carried out by nine ballistic missiles fired from U.S. and British military bases in northern Jordan. This has yet to be verified or confirmed by any other source at this time. Reports say that dozens loyal to the Syrian regime were killed in the explosion. Contrary to recent attacks on the Assad regime, after which the Syrian army reported its defense systems shot down some of the missiles, no such claims were made after the strike. According to the London-based war monitor, the Syrian Observatory for Human Rights, Sunday's attack had targeted a warehouse for missiles and killed 26 people, mostly Iranians and Iraqis. However, Iran's Tasnim News agency denied reports of rockets hitting an Iranian military base in Syria, killing Iranian advisers. On Monday, Israel's security cabinet convened following the airstrike. The session was unscheduled, and Ministers were told it would pertain to the Iran nuclear deal. Developments on the topic are reportedly being presented according to Haaretz. Sources in Syria reported explosions in military bases near the districts of Hama and Aleppo on Sunday night. As noted above, numerous Syrian media outlets claimed Israel is responsible for the attack, although so far the IDF has remained silent. The targeted bases were manned by the Syrian army as well as Iran's Revolutionary Guard, and housed several missile warehouses, according to the Lebanese newspaper Al Akhbar. The report adds that several dozen were wounded and evacuated to nearby hospitals. According to the report, Bunker Buster bombs were used, which makes it likely the launch was airborne. 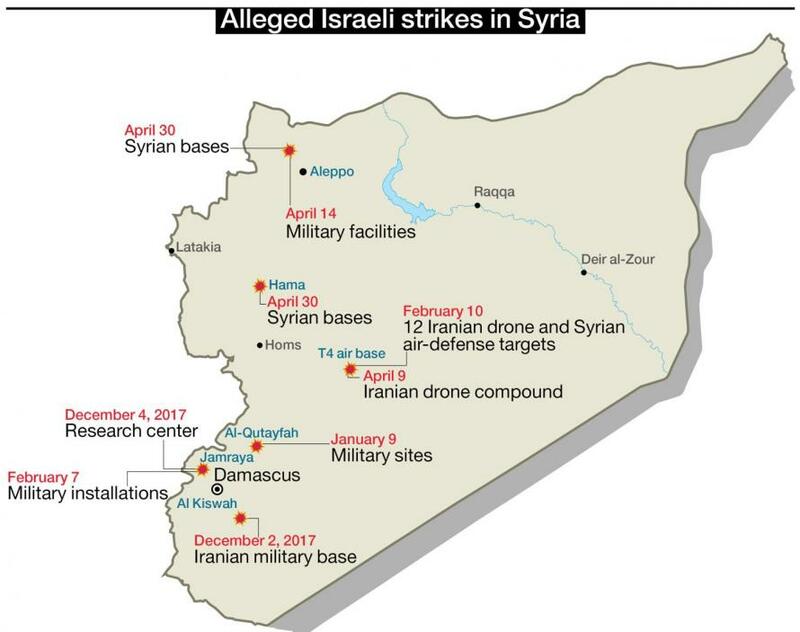 As the following map shows, in addition to the joint US strikes from early April, Israel has been busy pounding Syrian bases in recent months. The Iranian news agency Tasnim quoted the commander of the Iranian-backed Afghan militia Fatemiyoun as saying the the military base near the northwestern city of Aleppo is unharmed, as are his forces. Syrian state TV says successive blasts were heard in the Hama province and authorities are investigating the response. Shortly after the explosions, the European-Mediterranean Seismological Centre said the blasts caused a 2.6 magnitude earthquake in the area. The monitor said rockets also hit Syrian government bases in the region surrounding Nairab military airport, which is close to Aleppo International Airport. It was not immediately clear who was responsible for the rocket fire, the Observatory said. On Sunday, President Trump spoke with Prime Minister Benjamin Netanyahu, according to a White House readout. It said they "discussed the continuing threats and challenges facing the Middle East region, especially the problems posed by the Iranian regime’s destabilizing activities." The call took place just hours before Netanyahu met for the first time with Trump's new Secretary of State, Mike Pompeo, who is visiting the Middle East. Earlier Sunday, Defense Minister Avigdor Lieberman said Israel will maintain freedom of operation in Syria.